The anumara is a large edible caterpillar with a hook on its tail. It is a story about kinship groups - represented by the north and the south. Kunmanara Burton is in one group (the south - anumara) and his uncles, nephews, and fathers are in the other (north - the other caterpillars - muya muya and ngalyakanti, literally 'hard forehead'). All the caterpillars travelled from places in the north and the south, and met up in one resting place (ngura). When the minyma (women) and tjitji (children) arrive, the women dance in the fire and give the man the ceremonial stick. This is a beautiful ceremony, which the artist went through, long ago. This ceremony was not performed for a long time, until more recently, when men from Amata took part. It is important that these ceremonies are kept going. Kunmanara Burton is an important Anangu elder and leading artist in the Amata community. He was born in around 1937 and moved to Pukatja (Ernabella) as a child with his parents. He worked as a cattleman at Curtin Springs Station before moving to Amata to work on the Wingellina dams and to build and maintain fences. He sadly passed away in March 2017. 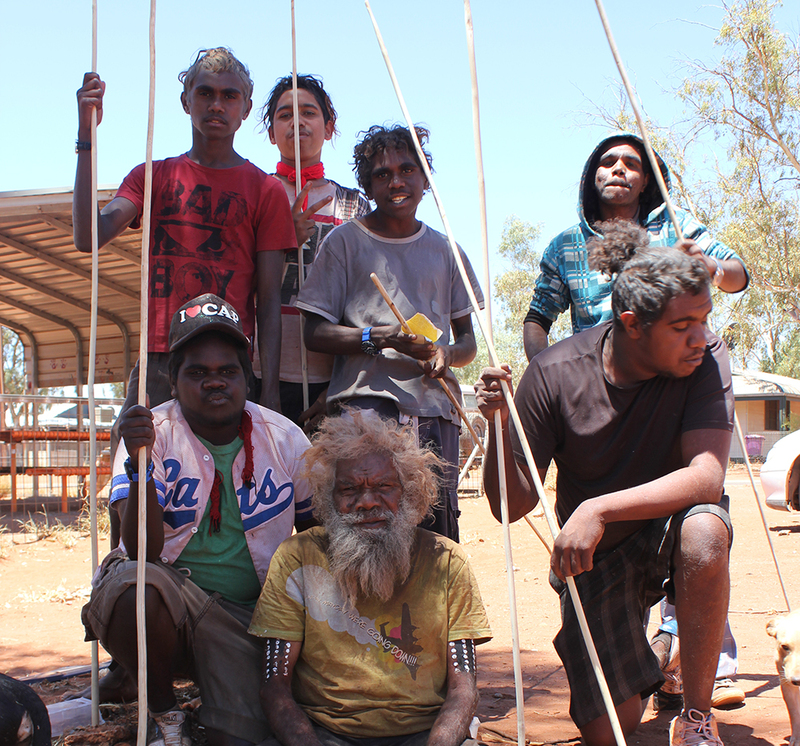 As a senior artist and lawman, Mr Burton is revered as a caretaker of Anangu law and culture. This is conveyed in the stories he paints on canvas, especially the Anumara Tjukurpa – the creation story of the edible caterpillar and its associated ceremonies that also talk about kinship groups in the southern region. In 2014 Hector was the recipient of the prestigious Red Ochre Award which is awarded by the Australia Council for the Arts for lifetime achievement and outstanding contribution to Indigenous arts and culture.